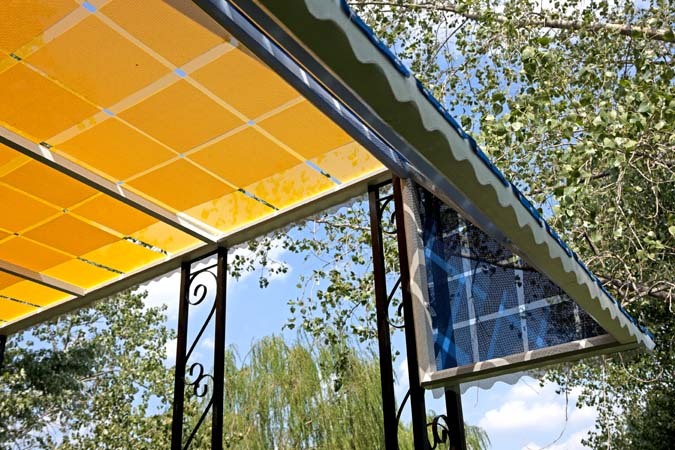 Awning Studies: SOCRATES, 2011 by Washington DC-based artist Patrick McDonough, is the culmination of a three-month Public Art Residency (PAR) Program, established in partnership with the Washington Project for the Arts (WPA). A collaboration between Socrates and the WPA was initiated in 2010, to introduce artists from the District of Columbia area to the practical and conceptual issues related to the creation of public art. McDonough is the second recipient of this award. The PAR Program is an extension of the Park’s ongoing OPEN SPACE series, a forum for single artists and collaborative projects. Awning Studies: SOCRATES, 2011 continues McDonough’s exploration of the awning as a key architectural adornment that is central to the domestic vernacular of the northeastern United States. His project takes the form of a series of fabricated awnings without buildings: some installed in tress, some arching over the water, and others rising on a combination of steel and clear acrylic supports. 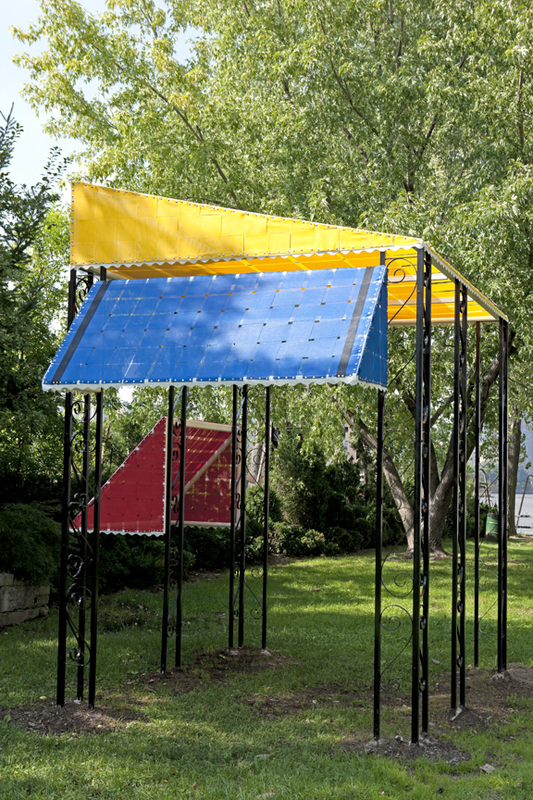 Awning Studies: SOCRATES, 2011 will be on view in the Park from September 10, 2011 through March 4, 2012. Upon the conclusion of his exhibition at Socrates, McDonough will re-install his residency project in Washington, DC. This project, a partnership of Washington Project for the Arts and Socrates Sculpture Park, is made possible by the many generous supporters of WPA and is funded, in part, by the DC Commission on the Arts & Humanities DC Creates! Public Art Program. Socrates Sculpture Park’s Exhibition Program is supported by the generosity of Lily Auchincloss Foundation, Bloomberg Philanthropies, Mark di Suvero, Lambent Foundation Fund of Tides Foundation, Spacetime C.C. and is supported, in part, by an award from the National Endowment for the Arts. This program is also supported, in part, by public funds from the New York State Council on the Arts, a state agency, and by public funds from the City of New York Department of Cultural Affairs in partnership with the City Council. Special thanks to the City of New York, Mayor Michael R. Bloomberg, Queens Borough President Helen M. Marshall, City Council Speaker Christine C. Quinn, Assemblywoman Catherine Nolan, City Councilmembers Jimmy Van Bramer and Peter F. Vallone Jr., and the Department of Parks & Recreation, Commissioner Adrian Benepe.